Posted on 11, May 2016 by EuropaWire PR Editors | This entry was posted in Automotive, Energy, Gas & Oil, France, Transportation & Logistics and tagged Berlingo, Citroën C3, ENGIE Cofely, Joël Verany, Jumper vehicles, Jumpy. Bookmark the permalink. PARIS, 11-May-2016 — /EuropaWire/ — Under the terms of a sale agreement with ENGIE Cofely, PSA Retail Business Paris made a spectacular delivery of 291 Citroën vehicles on 10 May 2016. The fleet includes C3, Berlingo, Jumpy and Jumper vehicles. The large-scale operation saw all 291 vehicles line up for delivery in a massive building adjacent to the Aulnay delivery centre on 10 May 2016. 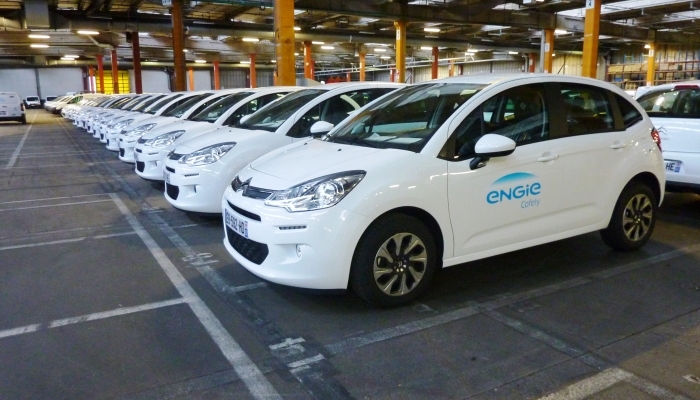 The 48 C3, 215 Berlingo, 23 Jumpy and 5 Jumper vehicles all bear the branding of ENGIE Cofely, a major energy and environmental performance player in France and worldwide. In a tightly managed logistical operation, all vehicles had to be picked up by their users or fleet managers between 6.30am and 2.30pm, making this the largest delivery in a single instalment ever carried out by PSA Business Retail Paris. Citroën won the tender to manufacture the 291 vehicles, while professional leasing companies Alphabet and ALD were contracted for the financial side of the deal. Alphabet arranged long-term lease financing for the Berlingo and Jumpy vehicles and ALD set up the finance scheme for the C3 and Jumper vehicles. ENGIE Cofely, a leading energy and environmental performance company, naturally attaches great importance to the energy efficiency and environmental footprint of its fleet. The eco-performance of the four models was a key factor in ENGIE Cofely’s choice of providers for this contract.